You can add a new spot to your list of restaurants to try, especially if you’re craving a gourmet burger and a craft beverage. Stack 571 Burger and Whiskey Bar has newly opened in Olympia. Locals have been pleasantly surprised to find this new and tasty eatery tucked into Capital Mall, across from Miss Moffits Comfort Kitchen and near the Century Cinemas. An open floor plan with both main dining and bar seating gives it a fun and casual atmosphere. Be prepared for a busy crowd on the weekends, but the staff and servers are helpful, friendly, and the wait is never long. “Word of mouth is spreading,” says general manager Jake Melvin. “We’re getting great reviews and we’re getting more and more people coming in every day and letting us know it’s their first time here.” What draws guests to Stack 571 is definitely the food and the culture, he adds. The restaurant prides itself on their fresh, locally sourced ingredients. All burgers are a full half pound certified all-natural beef, raised by RR Ranch in Eastern Washington. Jake recommends Stack 571’s signature burger, The Stack – two four-ounce patties stacked on top of each other. “But if I’m going for something that’s not as traditional, I love our bahn mi burger,” he adds. Stack 571 has nine other unique, gourmet burgers on the menu. And they offer gluten-free buns or a veggie patty for the herbivores. 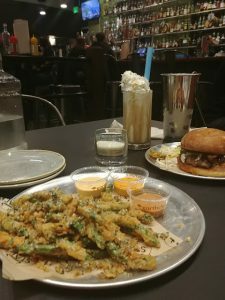 I was impressed by Stack 571’s Healthy Burger that comes with a veggie patty, fried green tomato, veggie sprouts, avocado, and green goddess dressing. Like all of Stack 571 burgers, it had a lot of great texture and interesting flavor. Try some of their side dishes or small plates as well, like the truffle fries, pulled pork sliders, or fried green tomatoes with bacon Tapatio ranch. If you like a shake with your burger, there’s six flavors to choose from. Or make it a shake-with-a-shot, like the Chipotle Chocolate Cherry with Evan Williams bourbon. Stack 571 also has an extensive cocktail menu, over 113 whiskey varieties, and local beer from Lacey Lager, Top Rung, and Matchless Brewing, among others. All the cocktails on the menu were specially created by Zack McIntire, Stack 571’s beverage coordinator. 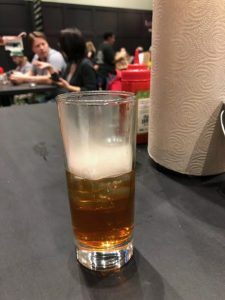 His knowledge and creativity brought the signature Smoke Stack Maple Fashioned, with maple syrup, aromatic bitters, and apple wood smoke, which you can smell as you enter the bar. Other popular drinks are the bourbon sangria and the gardener’s gimlet with fresh cucumber and basil. “Another real popular drink that people really like is our Stack Smash,” says Jake. “The way you can think about it is like a snow cone bourbon drink.” Zack creates the drink by taking ice in a bag, and smashing it loudly with a hammer, making sure to be heard across the dining room and piquing curiosity in the guests. “Zack is incredible, and I’m so happy that he’s with us,” shares Jake, who also praises his whole team at Stack 571. “We have a special thing going on here. My management and chef team that I have here with me, they’re incredible,” he says. As well as offering quality, local food, Stack 571 also prides the restaurant on their hospitality and professional service. Stack 571 actually began in Alaska, where co-owner Attila Szabo first started a restaurant called Glacier BrewHouse. Taking that concept to Washington, they opened two more restaurants called WildFin American Grill, where Jake first joined the team five years ago. “Attila approached me and said that he had a new concept that he wanted to start. He wanted to open a gourmet burger and whiskey bar,” says Jake. The first Stack 571 opened on Ruston Way in Tacoma, and was named after the formerly nearby Asarco smoke stack, which happened to be 571 feet tall. 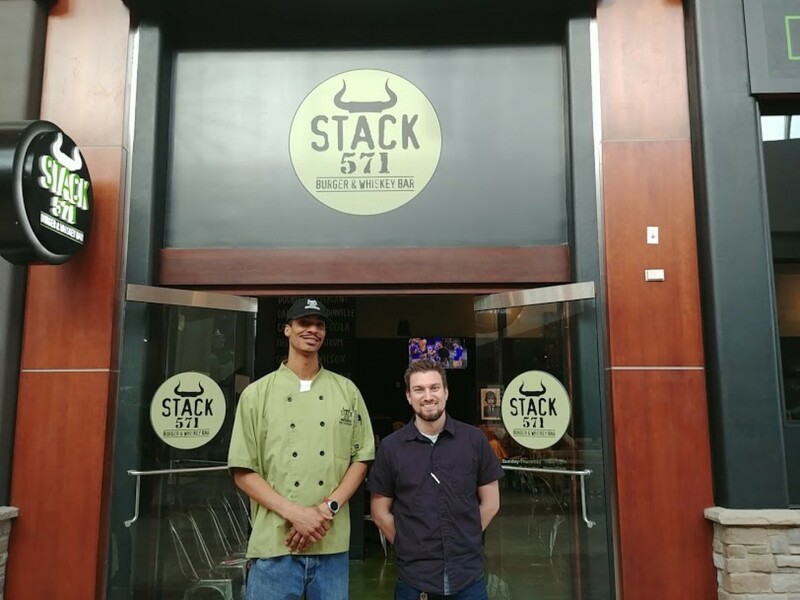 Since then, Stack 571 has expanded to three other locations in Bothell, Lake Tapps, and now Olympia, all of which have opened in 2018. Great food, excellent drinks, and a fun atmosphere make Stack 571 a must-try. See for yourself what makes Stack 571 a great place to dine with friends and family. They are located at 625 Black Lake Boulevard, Suite 530, and open seven days a week, and happy hour is from 3:00 to 6:00 p.m. and 9:00 p.m. to close, every day.